A-Frame is a WebVR framework to build virtual reality experiences. It comes with some bundled components that allow you to easily add behavior to your VR scenes, but you can download more –or even create your own. In this post I’m going to share how I built a VR scene that integrates a physics engine via a third-party component. While A-Frame allows you to add objects and behaviors to a scene, if you want those objects to interact with each other or be manipulated by the user, you might want to use a physics engine to handle the calculations you’ll need. If you are new to A-Frame, I recommend you check out the Getting started guide and play with it a bit first. The source code is at your disposal on Github to tweak and have fun with. aframe-physics-system is middleware that initialises the physics engine and exposes A-Frame components for us to apply to entities. When we use its static-body or dynamic-body components, aframe-physics-system creates a Cannon.Body instance and “attaches” it to our A-Frame entities, so on every frame it adjusts the entity’s position, rotation, etc. to match the body’s. If you wish to use a different engine, take a look at aframe-physics-system or aframe-physics-components. These components are not very complex and it should not be complicated to mimic their behavior with another engine. Static bodies are those which are immovable. Think of the ground, or walls that can’t be torn down, etc. In the scene, the immovable entities are the ground and the bumpers on each side of the bowling lane. To display the “hands” of the user (i.e., to show the tracked VR controllers as hands) I used the vive-controls component, already bundled in A-Frame. The challenge here is that the user’s avatar (“head” and “hands”) is not part of the physical world –i.e. it’s out of the physics engine’s scope, since the head and the hands must follow the user’s movement, without being affected by physical rules, such as gravity or friction. In order for the user to be able to “hold” the ball, we need to fetch the position of the right controller and manually set the ball’s position to match this every frame. We also need to reset other physical properties, such as velocity. Note: a better option would have been to also match the ball’s rotation with the controller. The throwing mechanism works like this: the user has to press the controller’s trigger and when she releases it, the ball is thrown. There’s a method in Cannon.Body which applies a force to a dynamic body: applyLocalImpulse. But how much impulse should we apply to the ball and in which direction? Note: If I had allowed the ball to rotate to match the controller’s rotation, I would have needed to apply that rotation to the velocity vector as well, since applyLocalImpulse works with the ball’s local coordinates system. However, this was outside of the A-Frame loop, and the computation of the throwing hand’s lastPosition and currentPosition was out of sync, and thus I was getting odd results when calculating the velocity. This is why I set a flag instead of calling launch directly, and then, inside of the throwing-hand’s tick callback, throwBall is called if that flag is set to true. Using the aframe-physics-system’s default settings I noticed a glitch when I scaled down the bowling pins: They were shaking and eventually falling to the ground! This can happen when using a physics engine if the computations are not precise enough: there is a small error that carries over frame by frame, it accumulates and… you have things crumbling or tumbling down, especially if these things are small –they need less error for changes to be more noticeable. The “sleep” feature of Cannon provides another possible workaround to handle this specific situation without affecting performance. When an object is in sleep mode, physics won’t make it move until it wakes upon collision with another object. Your turn: play with this! 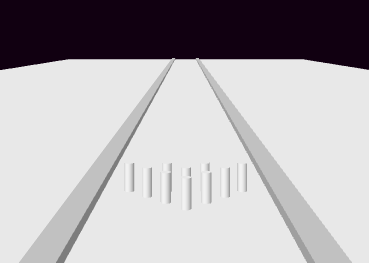 Automatically reset the bowling pins to their original position once they have all fallen. You can check the rotation of their bodies to implement this. Add sound effects! There is a callback for collision events you can use to detect when the ball has collided with another element… You can add a sound effects for when the ball clashes against the pins, or when it hits the ground. If you have questions about A-Frame or want to get more involved in building WebVR with A-Frame, check out our active community on Slack. We’d love to see what you’re working on.